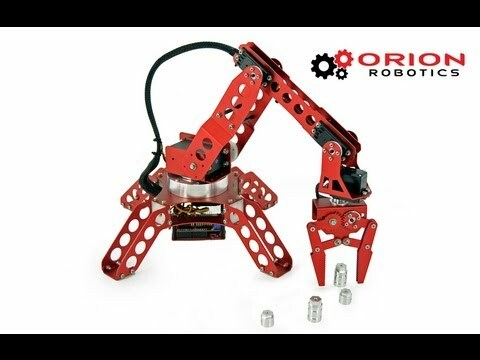 The Robotron arm robot kit is a 5 degrees of freedom arm and was built as an extremely solid and capable robot arm platform. Robotron is made from all aluminum anodized brackets. The rotation is a custom 6061 aircraft grade aluminum collar with industrial bearing. Robotron includes the new HV220 digital servos and one giant scale digital servo. Robotron is able to detect both position and force. The position and force feed back features of the HV-220 servo gives the arm the ability to sense its environment. Robotron can feel when it has an object and control the amount of force used to pick up the object with no additional sensors. Robotron can sense position and force at all servos. This allows Robotron to return to a home position gradually or stay in its current position even after power is lost. need more? views on this channel ! I checked your website. Great? products! Can? you controll it with the wireless controller as well?